There are many good reasons why you should choose Hiroshima Airport to land, especially for those who intend to do self-drive in Japan. The areas that we wanted to cover are Shikoku, Kansai & Hiroshima. This part of Japan is still very much underexplored by foreigners but full of hidden gems. I love how these attraction sites here have a fewer crowd which allows me to shoot many great photos. Hiroshima Airport has both domestic and international flights. Domestic flights can be booked to and from Tokyo Haneda and Narita, Sapporo, Sendai, and Okinawa (Naha). International flights include destination such as Seoul, Dalian, Beijing, Shanghai, Chengdu, Taipei, Hong Kong, and Singapore. For those who are using public transport may prefer Kansai Airport or Fukuoka Airport to land as it is more convenient to get to their destination via Shinkansen or JR. However, if you are thinking of renting a car and do a road trip in Japan, Hiroshima Airport is a good choice. Recently, with the introduction of a cheaper airline, Hiroshima Airport has become a more appealing option to use. We have met tourists from Hong Kong and Taiwan using Hiroshima Airport to land and get their rental cars. 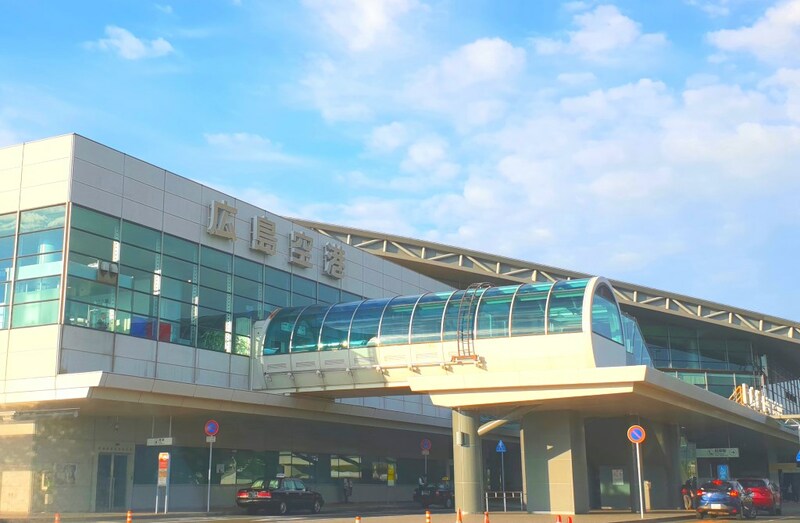 The Airport is not very big but it has three floors, the first floor is the arrival lobby, the second floor is the check-in counters & departure lobby, the third floor is the observation deck. The queue at the custom is not too long, there are two checks in the custom. The first check was to take your passport for photocopy & snap a picture of you & fingerprint by a young girl who does not wear a uniform. I don’t think she is the customs officer. The second check is at the real custom officer who will look at your passport and may ask you a few questions such as where will you stay or what is the purpose of the visit. Pick up your luggage and ready to go. There are English & Japanese (Kanji or Chinese words) written all over the signboard. Ask for information if you need to, the customer service officer is able to speak English. One of the major users who use Hiroshima Airports are cyclists who are going to explore Shimanami Kaido routes. The Shimanami Kaido has recently become so papular among cyclists abroad to Japan. Shimanami Kaido bicycles route starts from Onomichi Hiroshima and ends at Imabari Shikoku island. In the International arrival lobby, you will find a cyclist changing room, and outside of the room, there is a bicycle assembly space with tools for you to assemble your bike. You need to walk for about 5 to 10 mins to arrive at the car rental counters in Hiroshima Airport which is located at the other end. Show the counter staff your booking and he will arrange the shuttle bus to send you to the car rental office which is located about 5 mins from the airport. The first thing you will notice when you arrive in Japan is the number of vending machines in this country. Vending machines can be found everywhere and the best thing is they are not only selling drinks but other interesting stuff too. Expect little traffic at Hiroshima Airport so it is a good place to start your road trip with rental cars. There is a grace period for free parking, can’t remember is 10 or 15 mins. There are many souvenirs stores and great variety at Departure Hall which I am quite impressed and happy about. If you want to do some last minutes shopping, you are still able to find many interesting stuff. Anything with Hello Kitty print, dolls, bags, chopsticks, purse, handkerchiefs and many more. If you do not like the plane meal, you can get your own bento here. Are things more expensive at Hiroshima Airport? Food and souvenirs (omiyage) sold in Hiroshima Airport do not cost more expensive than outside. The price is the same as the other stores outside. I use to love Japanese “Omiyage”, usually individually wrapped food items such as sweet and crackers. But now I refuse to buy any of these beautiful pack omiyage. I feel it is not environmentally friendly and a waste of resources on multiple times of wrapping. I would prefer to get something with less fancy packaging. I highly recommend anyone who wishes to explore Shikoku-Kansai region by rental car to use Hiroshima Airport instead of Kansai Airport. It has fewer crowds, fewer cars and easier to navigate if you need to rent a car and drive. Most importantly, it offers cheaper flights to fly into Hiroshima for SIA/Silk Air. I weirdly love airports. But I haven’t traveled in a long time. Now you’ve sparked the travel bug in me! I love that they have bike rental in the airport as well! It is not the rental bike but for travelers who do their bike assembly there. Cyclists around the globe would love to do Shimanami Kaido route and land in Hiroshima Airport as it is the nearest airport. That’s was my favorite when I was young. I can’t believe i’ve never been to Japan yet ughhhhh!!! Hiroshima airport it is. Soon i hope. I have never been to Japan but now I know what airports to use when flying local if I`m ever lucky to visit Japan, thanks so much for sharing. Cheaper flights are always a plus but the stuff you can buy there looks awesome! This is the first time that I read an airport review and I totally appreciate this. This is so helpful for my next trip. i wish i read this before my visit! But yeah i’ll consider this next time! Thanks for sharing! Wow, can’t believe you can save so much just by changing the flight city. I actually love airport reviews! I forgot to read the reviews on Dubai Airport Terminal 2 and it literally was the WORST terminal ever! This will help so many people! I was in Dubai Airport last December and it wasn’t that bad but I could not remember which terminal I was it. I remember the McDonald was so packed even it was midnight. Hiroshima Airport has a section for you to asemble your bike. There are tools for you to use too. Wow love the concept of cycle renting. Lots of people would love that . And the airport looks cool too. Thank you for sharing. The Hiroshima Airport does not have bike renting facilities but it has a bike assemble section for bikers to assemble their bikes. That is a great deal! I would love to book the same thing as yours. The place is lovely and wonderful. Keeping this in mind when we go to Japan. My in-laws visited Japan last year and entered through Narita. Narita is the airport if you are visiting Tokyo area. Hiroshima airport is for people who wish to explore Kansai and Shikoku and Hiroshima region. Definitely a must see place for me and for my family. It is a beautiful place and I am sure my husband will really enjoy driving in that place. Driving in Japan is really fun to explore the different place you wish to visit with your own pace and cheaper too. Hiroshima Airport would be a great airport to land if you are thinking of doing Kansai and Shikoku region. Also, this part of Japan has fewer cars. Cheaper flight definitely is a reason to hook me to Hiroshima airport. Looks lovely too. There are not many flights coming in to Hiroshima but I know there are Seoul, Dalian, Beijing, Shanghai, Chengdu, Taipei, Hong Kong, and Singapore. None from the western world. Your overviews of this airport are so thorough and they give so much good infomation. Thanks for your comment. I hope to share my experience with others and also let them know that there are other airport beside Kansai Airport. These are some really good points and will help someone make a decision over which one to use. You are right, Hiroshima Airport is small and easy to check out from the airport, the traffic is smooth and efficient. Wow, I never knew I could save money just by changing the airport destination and the stuff that I can buy was just so awesome.. Thanks for sharing!